Tulsii – the Indian Basil plant often grown in the courtyards of Hindu families, is a revered symbol of worship in the Hindu religious tradition. The name 'Tulsi' dennotes "the incomparable one". Traditional Hindus worship this holy plant every morning and evening as a ritual. Tulsi grows wild in the tropics and warm regions. It is a branched, fragrant and erect herb plant attaining a height of about 75 to 90 cms when mature. Its aromatic leaves are round-shaped, growing up to 5 cms long with the margin being entire or toothed. The Tulsi flowers are small, reddish-purple in color, present in small compact clusters on cylindrical spikes. The fruits are small and the seeds are reddish-yellow in color. The Tulsi plant with light green leaves is called Shri / Rama Tulsi and the plant variety with dark red leaves is called Krishna or Shyama /Manjari Tulsi. 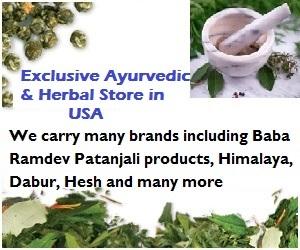 The extracts (juice/oil) of the Shri / Rama Tulsi plant is widely used for its Ayurvedic medicinal value. The juice of leaves, or a concoction, called Jushanda, is a kind of tea, giving relief in common cold, fever, bronchitis, cough, digestive complaints, etc. Marked by its strong aroma and astringent taste, Tulsi is also known as "the elixir of life" as it promotes longevity. The plant's extracts can be used to prevent and cure many illnesses and everyday ailments like common cold, headaches, cough, flu, ear-ache, fever, colic pain, digestive disorders, etc. This sacred Basil, Ocimum Sanctum, is a fragrant, medicinal plant that also keeps away mosquitoes and flies. It offers a herbal remedy for serious ailments like inflammation, heart disease, various forms of poisoning, malaria, diabetes, hepatitis and psychosomatic stress disorders because of its anti-bacterial, anti-fungal and anti-viral properties. The Krishna / Shyama Tulsi plant is widely used for everyday worship in all Hindu Brahmin families. Many Hindu households have a Tulsi plant in the courtyard, grown in a specially built structure, having images of deities installed on all four sides, and an alcove for a small earthen oil lamp. Some households can even have up to a dozen Tulsi plants on the verandah or in the garden forming a Tulsi-Van or Tulsi-Vrindavan - a miniature basil forest. Places that tend to inspire concentration and places ideal for worship, according to the Gandharva Tantra, include "grounds overgrown with Tulsi plants". The Tulsi Manas Mandir at Varanasi is one such famous temple, where Tulsi is worshipped along with other Hindu Gods and Goddesses. Vaishnavites or Believers of Lord Vishnu worship the Tulsi leaf because it's the one that pleases Lord Vishnu the most. The story of Lord Krishna has it that when Krishna was weighed in gold, not even all the ornaments of Satyabhama could outweigh him. But a single Tulsi leaf placed by Rukmini on the pan tilted the scale. In the Hindu mythology, Tulsi is very dear to Lord Vishnu. Tulsi is ceremonially married to Lord Vishnu annually on the 11th bright day of the month of Kartika in the lunar calendar. This festival continues for five days and concludes on the full moon day, which falls in mid October. This ritual, called the 'Tulsi Vivaha' inaugurates the annual marriage season in India. Hindu Mythological Tales narrate that Tulsi, a destitute woman, was accused of infidelity and shunned by all. Finding no shelter in the world, she turned to Vishnu for help. But the gates of Vaikuntha (Vishnu’s Abode) were shut on her as Vishnu’s Consort Lakshmi refused to let her in. Tulsi stood in the courtyard of Vishnu’s abode, under the open sky, helpless and humiliated. Her feet turned into roots, her arms sprouted leaves, and she turned into a delicate yet wild plant, her fragrance spreading all around.Lord Vishnu said: “By not abandoning her devotion to me, despite all odds, Tulsi has become my beloved, ‘Vishnupriya’. She should be treated with dignity at all times - not as an unchaste woman, but as a venerable housewife, a ‘Sumangali’. No worship of Vishnu is complete without an offering of Tulsi sprigs. And so the Tulsi plant is nurtured in the courtyard of every house, and is identified as Vishnu’s Vrinda or Krishna’s Radha, women whose devotion for the Lord, though unrequited, never waned. Thus, Tulsi is seen as Lakshmi’s co-wife for her unconditional devotion to Vishnu, but as Laksmi is very jealous of her, she resides in the home whereas Tulsi remains in the courtyard. Another story goes that Tulsi was the paramour of Lord Vishnu. Out of Jealousy, Lakshmi cursed her into becoming a plant and the Lord transformed himself into the sacred Shalagrama Stone to keep her company. The Shalagrama is a small stone, an ammonite, a fossil genus of marine cephalopod, considered to be a natural representation of Lord Vishnu. Shalagramas are found in the Gandak river of Nepal. They are usually black or dark green colored, round or oval in shape, striated with tree-like markings. The curves of the striations signify the various forms / reincarnations of Vishnu. The worship of Shalagrama doesn’t involve elaborate prayer rituals. It is kept wrapped in a cloth, often bathed and perfumed. Its very presence in a home bestows health, wealth and happiness on its inhabitants. By convention, the Tulsi Leaf is not offered to Shiva, just as Bel Leaves, dear to Shiva, are not offered to Vishnu. Tulsi leaves are also not offered to Goddess Lakshmi as she was once annoyed during her love-sport with Vishnu, when his attention got diverted towards Tulsi. Necklaces of Tulsi Beads are used as Rosaries while chanting the name of Lord Vishnu. These are kept in special cloth bags to prevent their contamination. Thus, Tulsi – The Courtyard Plant is not only a symbol of sacred virtue in Hindu religion, it is also well-known and well-used as a medicinal herb for curing human ailments, as an alternative therapy in Ayurveda.